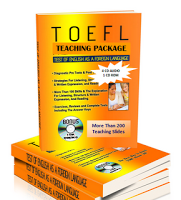 Toeflskill.com is created to share information about TOEFL Preparation Course. The source is mostly taken from LONGMAN INTRODUCTORY COURSE FOR THE TOEFL TEST book. It focuses on PBT (Paper Based Test). What is TOEFL and TOEFL Test? What is TOEFL for? or what are the advantages of TOEFL? Types of TOEFL Test and the differences of them. To make you easy to understand this blog, please read how to study TOEFL Preparation Course here.